Rehearsal Log: DRESS REHEARSAL & PERFORMANCE — A.B.L.E. 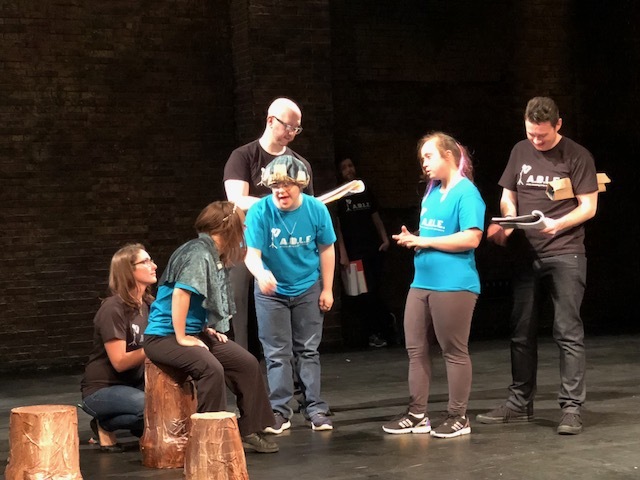 Over the past several Rehearsal Logs, we've shared all the details of how the ABLE ensemble devised our thirteenth stage production. In preparation for our next play, Cyrano de Bergerac, we explored the theme of inner and outer beauty. 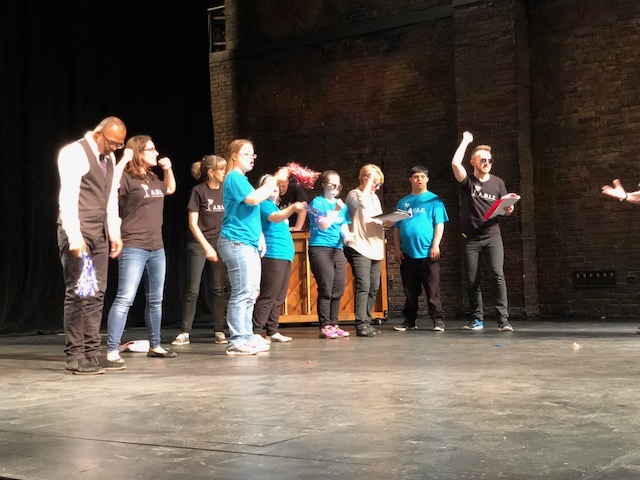 Supported by our team of teaching artists and volunteer facilitators, Our Monday and Friday groups each invented 3 characters that have incredible inner talents but also have something that others make fun of them for. They built stories from the ground up and made choices about every detail from scripting to staging. A.B.L.E. strives to be a platform for individuals to develop and share their voices. Our devised shows are always special because they show the depth of our ensemble, and reveal what’s in their hearts and minds. Each Main Character in these stories has a little bit of each actor inside. These stories reflected their interests, concerns, passions and humor. There is no better way for an audience to see who they are and all that they are ABLE to do. We try to make dress rehearsal as close to a real performance as possible. Our teaching team and facilitators arrive early to do a walk through of the theatre and set up. We arrange prop tables, hang up posters backstage with the show order and costume notes, and make "places" for each actor in the wings. Once organized, we meet onstage to work over any complicated blocking and bigger group numbers. Once our actors arrive, we take 30 minutes to warm up onstage - this gets everyone used to being on the stage but in a relaxed way. From there, we head backstage to the dressing rooms for a quick break and then we go straight into our runthrough. For this dress rehearsal, facilitators Marcus and Alison, and our friend Will stayed in the audience to cheer us on and give some feedback as we went through. There are a lot of new elements at dress rehearsal - a new space, some new people, lighting, and props - so we take our time and all of the teaching artists take good notes. We managed to make it through all of our scenes and check in pieces in just about 90 minutes which is pretty good considering it was the one and only time we ran the whole show from start to finish all together! After all the actors went home, our teaching artists and facilitators went out for dinner next door at Fiesta Mexicana to talk over notes and hash out final details before the big day! After what seemed like forever (but was really only 30 minutes), Kendra finally called for places and all of our actors headed to their chair while Katie went out to greet the audience, and away we went! We had a big house, with many people joining us for their very first ABLE show. They were a warm and receptive crowd who cheered us on, gave lots of laughs, and were on their feet before we even finished out big closing number. Alison Perrone for your incredible work designing and building complex props including a bus, a limo, a Hollywood sign, and so many babies! The Biograph for hosting our ensemble's performance and seamlessly managing everything from ticket sales to backstage needs. The Puffin Foundation for sponsoring props and costumes for this production. And thanks to YOU for following along on this journey and supporting us from near and far! We're taking a little break for the winter, but rehearsals will kick off again on February 23rd for our next show, Cyrano de Bergerac! Stay tuned!